One of the must fun parts of winter in Kenosha is sledding. Children love sledding down big hills near their home. Sledding is a very fun and family-friendly activity but it does have some safety concerns. Small children require adult supervision during sledding. Do not let a toddler or small child go sledding alone or alone with other children. One parent or adult should be present to ensure small children are being careful on the sledding hills and wearing all of their winter gear the entire time. Be sure small children are dressed head to toe in warm clothing. Toddlers should wear long sleeves and warm pants underneath snow pants and a winter coat. Children should also wear snow boots, gloves or mittens, a warm hat and a scarf during sledding. We do recommend removing some of the layers after you return to the warm car. Bulky layers can cause other car safety concerns. Choose a sledding hill that is free of obstructions. Small children might not be able to navigate a sled fast enough to avoid obstacles on the hill. Common obstructions include trees and fences. Find a sledding hill that is a flat slope completely clear for sledding. Do not allow small children to sled head first. Encourage toddlers to either sit on their bottom on the sled or lay down feet first. Head first sledding can lead to much more serious injuries. If possible, go sledding during times where you don’t anticipate a large crowd. The less people on the hill, the better chance your small child can sled safely. If there are older children on the hill or teenagers, consider relocating to another part of the hill where there are only other small children. 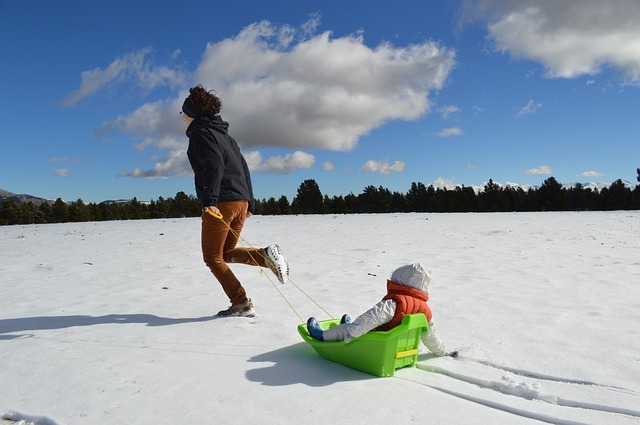 Older children might sled too fast or too dangerously near your small child. Be careful this sledding season and follow our tips above. Cornerstone Academy daycare in Kenosha wishes every family a safe and happy Wisconsin winter!